Panna cotta is an Italian dessert made by simmering together cream, milk and sugar, mixing this with gelatin, and letting it cool until set. An Italian phrase which literally means "cooked cream", it generally refers to a creamy, set dessert from the Northern Italian region of Piedmont. It is eaten all over Italy where it is served with wild berries, caramel or chocolate sauce. It is not generally known exactly how or when this dessert came to be, but some theories suggest that cream, for which mountainous Northern Italy is famous, was historically eaten plain or sweetened with fruit or hazelnuts. Earlier recipes for the dish used boiled fish bones in place of gelatin; however, sugar, a main ingredient, would not have been widely available as it was an expensive imported commodity. After years this treat evolved into what is now a gelatin dessert, flavored with vanilla and topped with fruit or spices, and served chilled. Similar versions of this dish are also found in Greece and France. This is a great quick dessert that will get rave reviews. It is the perfect treat on a hot summer night. I like to serve it with berries. Thanks to Tricia Porter for sending in a picture of this recipe. She served it on Valentines day to her family. Tricia will receive a bottle of home-made jam for sending in a picture! Pour 2 tablespoons water into small bowl. Sprinkle gelatin over water. Let stand until softened, about 15 minutes. Whisk 1 cup cream, yogurt, and vanilla in large bowl to blend. Heat remaining 1 cup cream and 1/2 cup sugar in small saucepan over medium heat, stirring until sugar dissolves and cream comes to simmer. Remove from heat. Add gelatin mixture, stirring to dissolve gelatin. 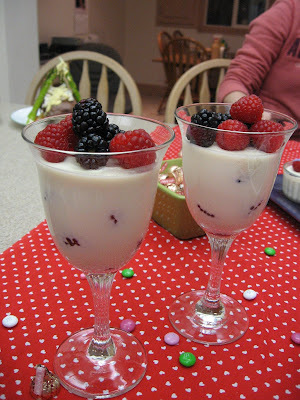 Mix hot cream-gelatin mixture into yogurt mixture in bowl. Divide mixture among ramekins. Refrigerate desserts uncovered until cold, then cover and refrigerate overnight.